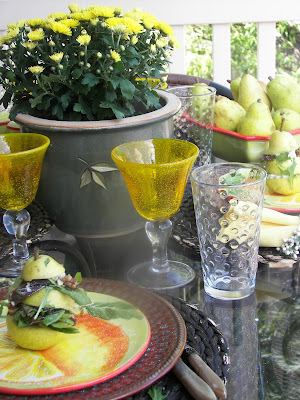 Hi everyone -- welcome to Tablescape Thursday and to my Girard Salad Dressing giveaway at Red Couch Recipes. Today at Red Couch Recipes, I feature a pear tablescape. 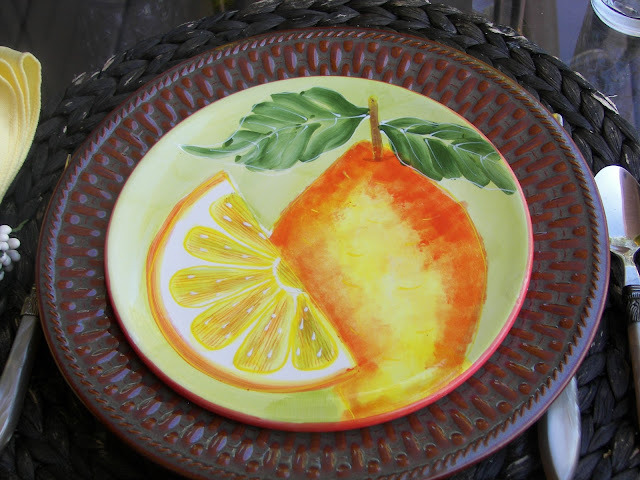 These are such fun salad plates; I have also used them for a lemon tablescape -- love the double duty of these. If found a bargain on some Bartlett pears that are just about to ripen. I plan on making several pear baked goods if the "Food Critics" don't get to them before I do :). After you view this week's tablescape, I am honored to be giving out a 4 pack of Girard's Premium Salad Dressing to one of my readers. I received this 4-pack in the mail and some extras goodies, because I am now officially a " Girard Epicurean Expert." These will be the same 4 salad dressings that will be given to one of my readers. See below for details. I picked up an outdoor mum for about $2.00, on sale. I always bring one inside for an inexpensive splash of color in the fall. 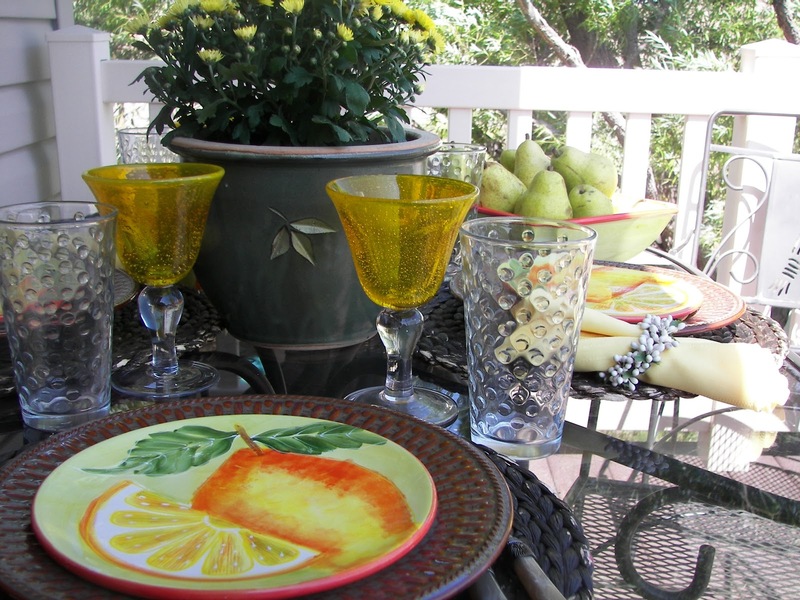 Today it colors my Pear Table on the deck. These are some of the lovely pears that I purchased. The bowl is a matching piece to the salad plates. Seeing life though a bubbly yellow and bubbly clear glass. Which view do you like best. 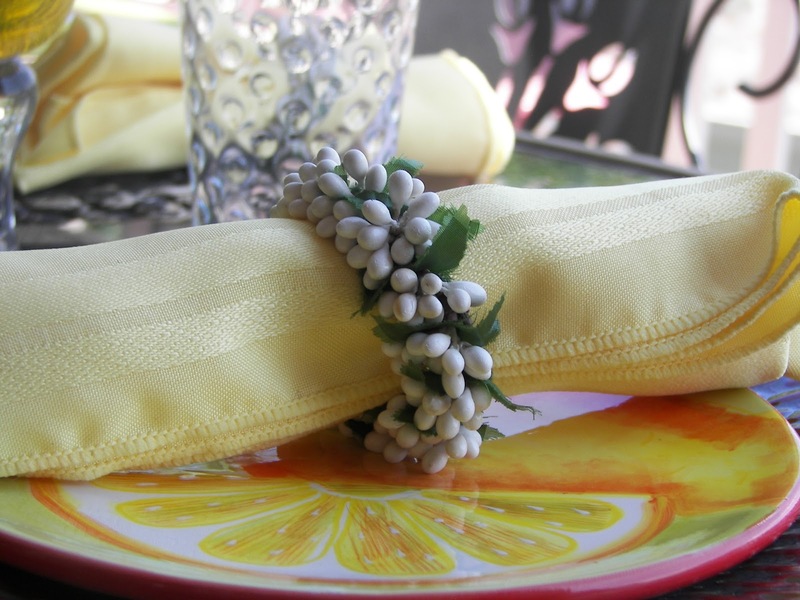 The napkin rings add a bit of softness, don't you agree? 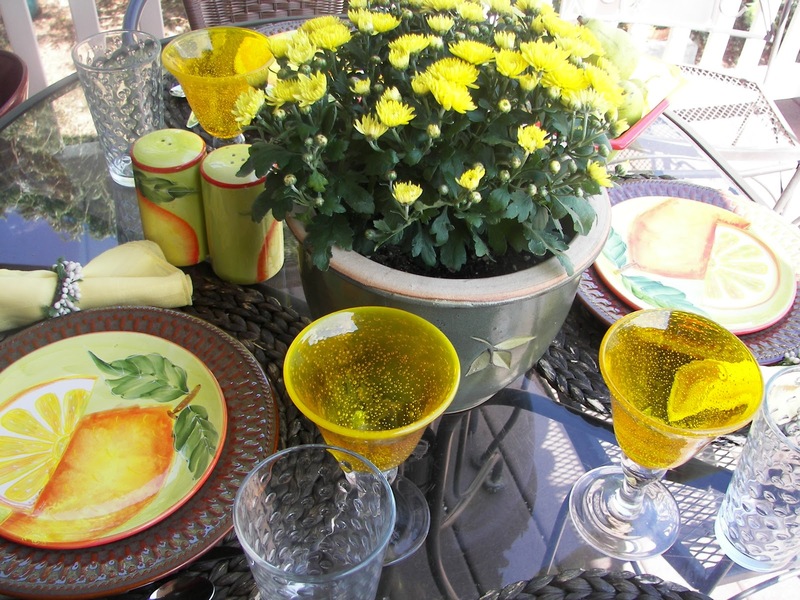 Will we have too many more lovely days like this to dine on the deck? ***Greek Feta -- It's crying to be slathered over your olives, lettuce and feta. ***Old World Italian -- This is a spectacular Italian -- rich and full of flavor. It will be delivered to your door -- love getting foodstuff in the mail! 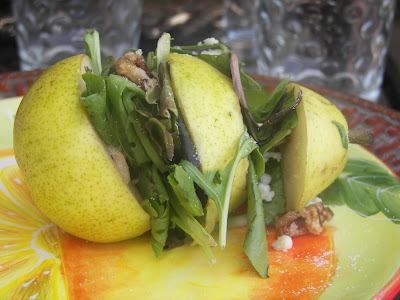 I made the Pear Salad featured on my table today using the White Balsamic Vinagrette. I drizzled it on the lettuce and on the pear -- delicious! The White Balsamic Vinaigrette is sweet, yet at the same time the flavor of the balsamic vinegar comes through. It's full of flavor and could be enjoyed not just on salads, but on tomatoes, beans, and other vegetables. It's a light tasting dressing, but is also full of flavor. The Marzetti Company, in addition to the dressings, also sent me some bamboo servers, a cloth grocery bag, an apron, a recipe card holder. The yellow mums just brighten up any area. I found the Pear idea on Pinterest. See the lovely salad dressing drizzled on the pear? The pear salad ready to be eaten. I recommend drizzling a little bit more dressing when you serve it. 1. MANDATORY--ONE CHANCE. Link to Everyday Elegance -- a site where Epicurious. Com and Girard dressings have teamed up together to bring recipes and lifestyle tips, and tell me in your comment, 1) What recipe you would like to try. 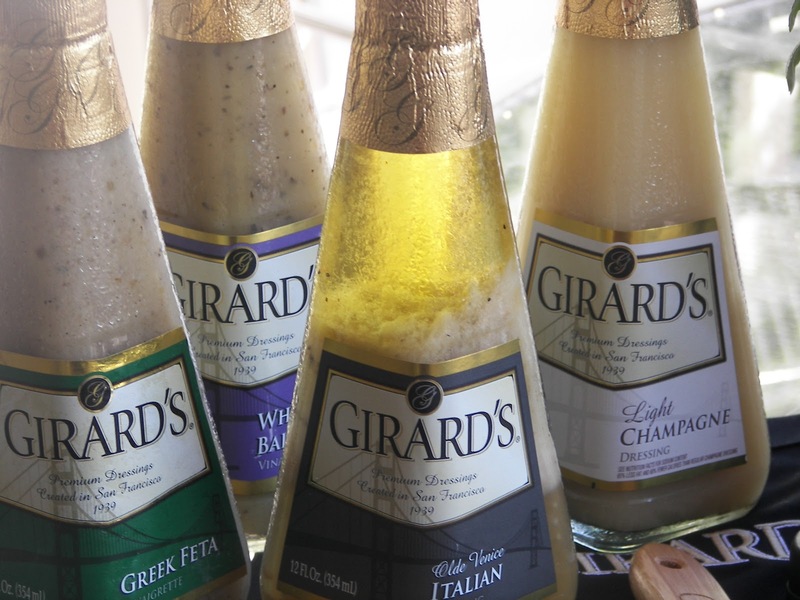 2) What is your favorite Girard's dressing. 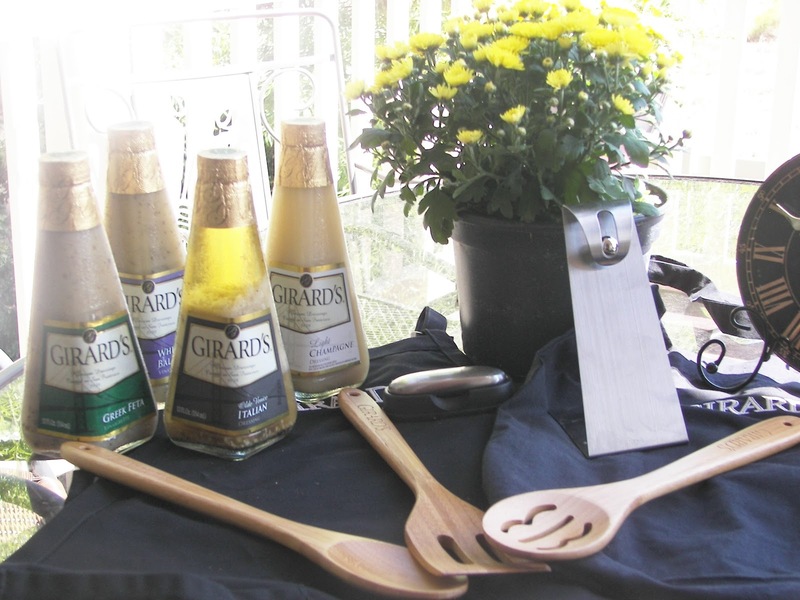 If you have not tried Girard's dressing, tell me which you would like to try. 2. NOT MANDATORY -- SECOND CHANCE. 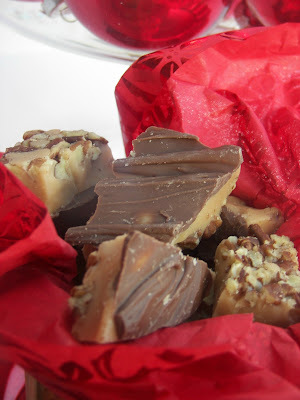 Join Red Couch Recipes via Google Friend Connect or tell me that you are already a Follower of Red Couch Recipes. 3. Open to those living in the United States Only. 6. You DO NOT have to be the host of a blog to win! However, I need a way to contact my winner. If your e-mail is not readily available on your blog or you do not have a blog, please post your e-mail in your comment. 7. You do not have to post separate comments. I thank the Marzetti Company for hosting this giveaway. I have not been compensated for writing this post, I did receive a sample pack of 4 dressings and some other Marzetti - branded items. Good luck and thanks for visiting Red Couch Recipes. Back again, I think the penne with turkey sausage and the light champagne dressing sounds very good, and perfect for fall. I would also like to try their Greek feta dressing, I would use that on an orzo salad with some grilled shrimp -mmmmm. Hi Joni - I'm drooling over the Greek Cauliflower recipe. I think I'm going to have to pick the Chinese Chicken Salad flavored dressing as the one I'd be most interested in trying. PS - I'm a long time follower of your blog. Your tablescape is so cheerful and inviting. 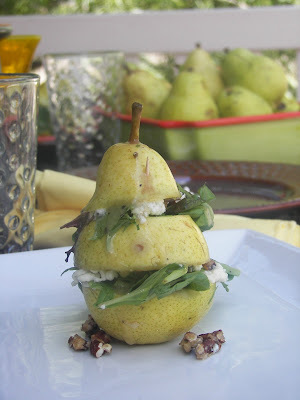 The pear salad looks wonderful. Thanks for the information on the salad dressings. I will try them. I am a long time follower. I saw that salad and want to make it for a dinner party. It is so elegant and I am sure it would be delicious with any of Girard's dressings. I just love them all. Your table turned out really pretty. 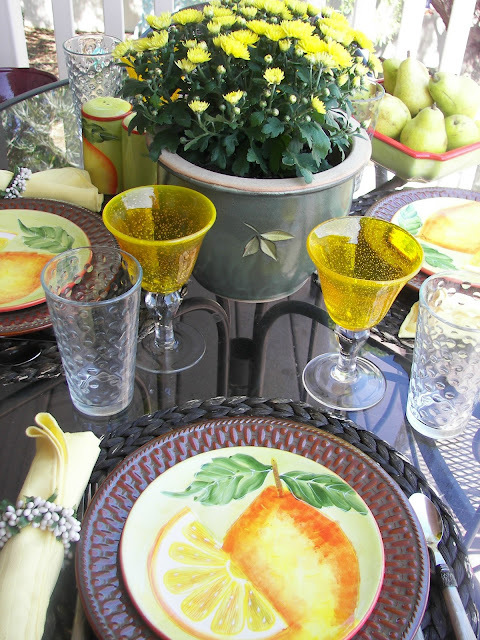 Isn't yellow just a wonderful color and how fun that you could use those great plates for lemons or pears. It is always so fun to talk with you on the phone too. I got your little thing from Target today. That will be fun for a giveaway. I pretty much wanted to try every recipe on there. The one that I know my husband would LOVE is the pork and white balsamic maple sauce. I've become a fan of white balsamic. He would also love your pear salad. And I love your table with the happy dishes, too. I'm a follower -- the dressings look wonderful! Love your pretty food on your pretty dishes. I love the beautiful pear salad. And I really want those yellow bubble goblets. I would love to try the fig bruschetta on the Girard site. It looks wonderful and I can actually get figs right now. Oh, I forgot to say I have long been a follower on Google reader. Cute, cute table and I love the pear sliced with the salad pics drizzled with the dressing. What a great idea! I'm a follower, you know it! 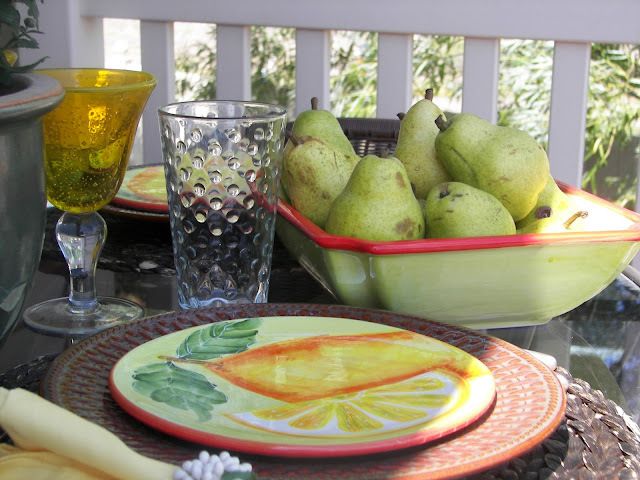 Love pear season and love the tablescape. I am a champagne fan and I follow! Lovely table, perfect for fall, so ready! Joni, your table is gorgeous. LOVE the plates!! It is summery, yet fallish. Perfect for this time of year! Thanks so much for stopping by "Take Six". I've never tried their dressings before but the apple poppyseed has me very intrigued. I'd love to try it in the grilled apple, cheddar, and red onion panini recipe. Hi there! I am IN LOVE With these plates of yours! Wow! Pears and lemons...so, so cute! Love the yellow stems too. You have set a darling little table with all your goodies. 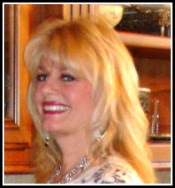 I am a follower of yours and will go over and check out the link! I'm thinking the Brick Chicken sounds like one I'd like to try. Love grilled chicken. However, I think the Greek Feta Dressing sounds really, really good. I've had the Italian before and they are good dressings! Hi, Joni! First, you did a great job with the stacked pear!!! Beautiful! It's always fun to eat food that not only tastes good but LOOKS sensational! Your table looks so nice and you did a wonderful job of pulling all the elements together. Have a safe and fun holiday weekend!!! 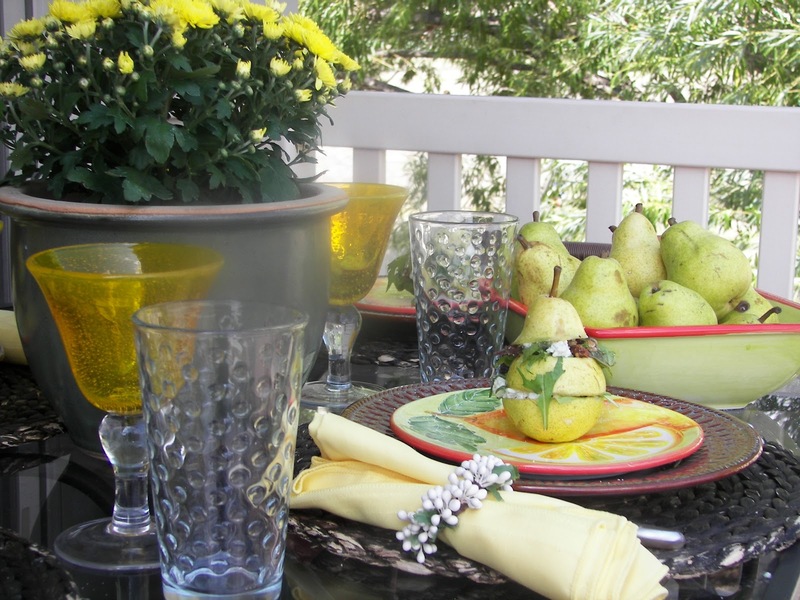 Beautiful pear tablescape. Had to go take a look at your lemon tablescape also. I appreciate your listing your tablescape information after each post...what a great idea! I am a follower and thought that I would enjoy the Warm Italian Potato Salad using the Olde Venice Italian Dressing. I just love the way they presented it. I would love to try the Brie and Fig Bruschetta recipe, yum. I like Girard's Champagne dressing (as well as several others). What a great giveaway! I love the tablescape. Those goblets really "pop" and look just perfect with the china. There is just something about pears that seems so elegant. Of course I am a follower and I would love to win the dressings! 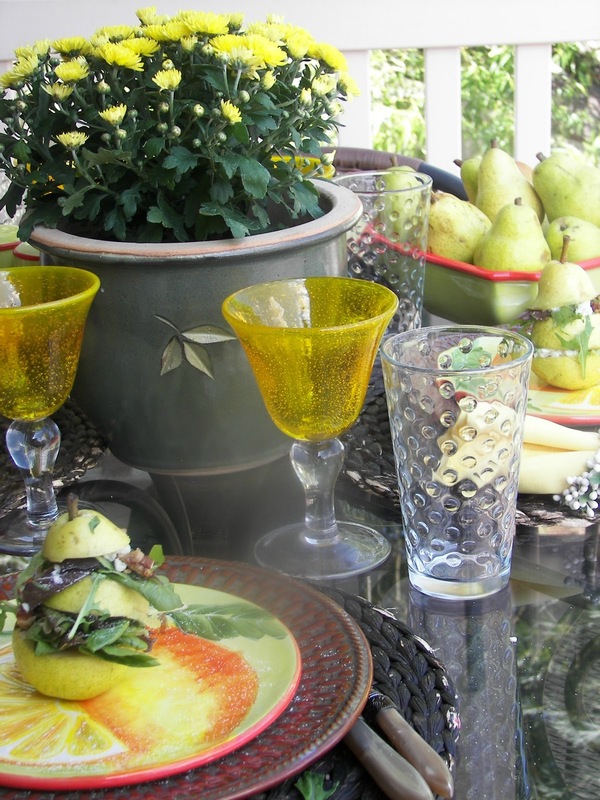 Your table looks wonderful and the pear does too! Joni, This was a recipe I was going to make this fall. It is gorgeous! And it looks so pretty with your table! I did go to Girards and love the savory apple and sausage bread pudding. Doesn't that sound so fabulous!!!! We are having company for the next 3 weekends and this would be a great brunch dish! I am a faithful follower of your wonderful blog! Joni, Your table is very pretty. 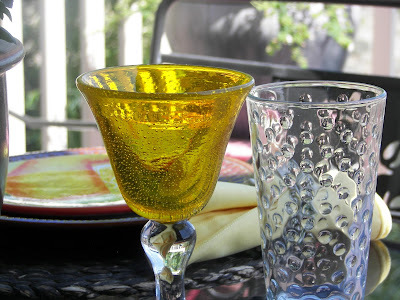 Love the napkin rings and salad plates, as well as the amber glasses. Have a great wknd! Thanks for a wonderful blog, I visited often and I'm inspired by your beautiful posts. I use and love Girard's Dressings. Light Champagne is my all time favorite. I think I'll probably start with the Rsted Greek Cauliflower as they are coming from my garden now. I've add their site to my Favorites (along with yours, of course). I think the Greek Roasted Cauliflower sounds fantastic. I think the Brick Chicken looks good from their site and they suggest Venice Italian, but I love the Raspberry and the Champagne ( really light and fabulous). Wow, there are so many refreshing recipes on their site. The watermelon, mint and feta salad sounds wonderful. I think it matches wonderfully with the Greek Feta dressing and I really want to try that! I'm the newest follower on your blog. Greetings! This is my first time at your blog, and thank you for the giveaway! I would make the Brick Chicken, and I've never tried these dressings and would love to do so. I think I'd like to try one of the Italian dressings for the Brick Chicken, although your White Balsamic sounds delicious. Great tablescape, by the way! I'm already a follower. Plus I LOVE Girard dresssings! Their chinese chicken dressing is to die for! 1.) The roasted cauliflower is one I would particularly like to try, although all look delicious. 2.) The While Balsamic sounds wonderful! I am also a follower. I love your blog! Thank you for the offer of a giveaway. I follow and love these dressings! !